I think I might be the only one who doesn't really like The Little White Horse . At first, I loved it. I was instantly sucked into the tale of young Maria Merryweather who has recently been orphaned. She leaves her family's house in London and travels to Moonacre Manor where she is to live with an uncle that she has never met. Upon arriving at her new home she finds that she belongs there. Everything about the place seems magical and charming and welcomes her in with open arms. Quickly it is revealed that there is a mystery surrounding the place and that there is evil in the land which can only be vanquished by Maria herself. How will she do this? She doesn't know. Who are all of these people that she keeps meeting in this fantastical land she has come to? She doesn't know that either. Facts continually unfold (almost on every page) as the story goes on and it keeps the reader interested enough in reading through to the end to discover how everything plays out. After finishing the read I looked up a bunch of reviews online and at Goodreads and no one mentions the fact that, at the conclusion of the book, Maria Merryweather gets married - at the age of 14. Which is just weird. My opinion of the latter two thirds of the book was that it was all "just weird." Conversations between characters are stilted and feel forced and sudden. The character of Maria Merryweather has a knack, I suppose, of making friends with everyone around her in a very instantaneous fashion and she and her cohorts keep no secrets from one another. She is familiar with everyone she meets in about two seconds flat and I found that, frankly, unbelievable. I'm a "first impressions" sort of girl myself. I find that I either love people or am suspicious of them fairly straight away. But even if I find myself adoring a person, I exercise a little caution in sharing freely. Friends take a little time to make, in my experience. Even the best of friendships take some time to develop properly. Because the story is part fantasy, I can understand the reason for having lions and unicorns prancing about the pages. I did not mind them at all. (I thought the lion that was most entertaining character in the book but questions about its past were never answered satisfactorily to my tastes.) Perhaps one can even see thirteen year olds making mature decisions to eliminate foes together and then get married, but if you want me to believe it then you need to write your story remarkably well, placing it in either a specific time in history or a specific culture. The story was just written so weakly that I couldn't bring myself to believe in it a bit. Because it felt as if Goudge was writing by whim and by fancy I found no reason for any of her characters to be behaving as they did. Really, I found this read a bit of a disappointment as I went into it with high expectations which were ruthlessly dashed at the hands of a bad writer. The idea behind the story I thought was a good one. It is a super intriguing storyline which I found to be both unique and pleasant. Unfortunately I just didn't think that Goudge was able to pull it off and I ended up less than impressed. Ultimately I feel like I have to apologize for not liking it. I'm curious to see what I will think of it IF I CAN EVER GET IT! Our library has a couple copies that are checked out and were due in February. Why haven't people returned it yet??? Sorry that you didn't like it! I'll come back and read this when I've finished the book. I'm just at the point where they get to she's exploring her room in her uncle's house. And re: LMM - I KNOW! I did fully intend to and expect to love it. And was heartily surprised that I didn't. I LOVE Goudge's adult novels! Green Dolphin Street is one of the most insightful, amazing novels I have read. However, I tend to agree with you about her children's books. They have parts that are delightful and imaginative, but other parts are "just weird." There is usually something unsettling enough about them that I hesitate to recommend them. 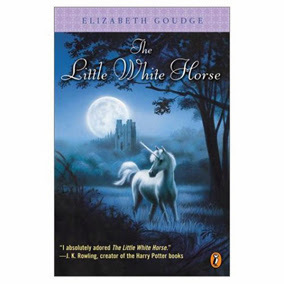 My initial impressions of The Little White Horse were favorable, but I haven't given it to my daughter yet. I am relieved to read your opinion of this book. I didn't like it either. I have nothing against mystery/magic/fantasy....in fact I think it is rather fun. But this felt like the author was making it up as she went along, rather than slowly revealing a wonderful, magical world. Hmmm...I'm reading this RIGHT now with my 10yo...so far, we've enjoyed it, but WOW...interesting about the ending chapters...I usually REALLY enjoy Goudge...we will have to see. Thanks for the review. I FINALLY finished this one. I didn't hate it, but I didn't love it.